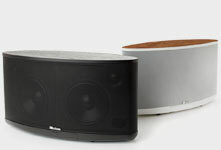 With Super Bowl almost upon us, and March Madness (basketball) barely one month off, the best way to deal with the winter (if you're in the north-east or mid-west of the US and much of Canada) is to cocoon at home with a great home theater system and a big screen TV. Even for a non-sporting type like me, the High Definition excitement of men's college basketball or football on a large screen has won me over, especially when football games are played in those outdoor stadiums in warm, sunny locations. 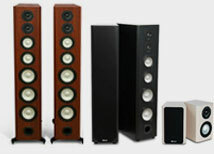 In these economically tough times, prices for Blu-ray hd players and large flat-screen TVs have come down dramatically, so an upgrade to a first-rate surround speaker system like Axiom, a Blu-ray player, HDTV display or a new AV receiver can be had for less than a couple of plane fares to a Caribbean or Mexican vacation. Look at it this way: sure, the warmth and beaches are nice for a week, but then the money is gone and you're back in the cold. Take the same funds and apply them to a new Axiom 5.1-channel surround system, or a large flat-screen LCD or plasma TV or AV receiver, and you'll have many years of enjoying great sound reproduction and Hi-Def images. I've heard that Blu ray HD Players are expensive and have glitches. Two years ago, that was true. Not anymore. The latest name-brand Blu-ray players (Panasonic, Samsung, and Sony) are available for $300 or less, and the glitches—agonizingly slow loading times of 1 or 2 minutes—have been fixed: these players typically load Blu-ray discs in 20 seconds or less. Standard DVDs are Standard Definition (SD), and no matter how much de-interlacing and scaling (up converting) takes place, the resulting image still isn't High Definition (HD). It's a mathematically interpolated version of HD-- good, yes, but not true HD. Blu-ray discs are HD, and the purity of color rendition and detail expose standard DVDs for what they are---good, but not great. We're already watching true HD from cable and satellite services, as well as over-the-air by antenna. It only makes sense to move to the disc format of High Definition—Blu-ray. My HDTV is just 720p. New flat-panel LCD or plasma TVs seem to be 1080p, which is what Blu-ray discs are. So what's the point of getting a new Blu-ray player if my TV can only display 720p? Your 720p HDTV display is still High Definition. As such, a Blu-ray disc player will output an HD picture to your 720p display that will be noticeably sharper and clearer than a standard DVD. While a 1080p display offers slightly improved clarity and color resolution compared to a 720p set, the difference is quite subtle and only visible when you're fairly close to the screen. Viewed farther back, it's quite difficult to discern the distinction between 720p and 1080p. Dolby Digital and dts 5.1-channel soundtracks from Standard DVDs sound pretty good to me. Aren't the Blu-ray soundtracks the same? Dolby Digital and dts soundtracks are remarkably good sounding, but they are lossy, and although the data losses are nowhere near as great as typical MP3 or i-Pod downloads, they still exist. This means a certain amount of data is thrown away in order to compress six channels of sound into the available space on a standard DVD. Blu-ray soundtracks are quite different: Dolby TruHD and dts-HD Master Audio are lossless soundtracks that are identical copies of a movie's master soundtracks when they are decoded. Only Blu-ray has the capacity to contain these. This is particularly good news for us here at Axiom, since we specialize in making products capable of letting you experience the huge dynamic range, more powerful bass, greater treble nuances, and essentially perfect fidelity to the original soundtrack mixes found on Blu-ray. But my AV receiver only has standard Dolby Digital and dts decoding. I can't benefit from the new lossless Dolby TruHD or dts Blu-ray soundtracks. Not necessarily. 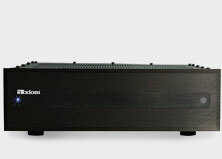 For quite a few years now, all but the least expensive AV receivers are equipped with a set of multi-channel analog inputs, typically a set of six or 8 RCA input jacks. If your AV receiver is so equipped, you only need find a Blu-ray player with internal decoding of Dolby TruHD and dts-HD Master Audio soundtracks. The Blu-ray player must also have a set of multi-channel analog outputs (not all do) that let you connect the decoded 5.1 or 7.1-channel RCA cable set to your AV receiver's multi-channel analog input set. The latter set of inputs keeps your AV receiver from becoming obsolete so long as the Blu ray hd player has the required 5.1 or 7.1 analog output set and internal decoding of Dolby TruHD and dts-HD Master Audio. My AV receiver doesn't have HDMI inputs so I can't connect a Blu-ray player. Yes, you very likely can. Virtually all HDTV video displays have one or more HDMI inputs, so you can bypass your AV receiver and connect the Blu-ray player's HDMI output directly to your TV's HDMI input, using the TV's source selector to choose the HDMI input when you want to watch Blu-ray discs. So you'll still benefit from the upgraded Blu-ray disc's video quality. However, you'll need to get a Blu-ray player with internal Dolby TruHD or dts-HD Master Audio decoding and analog multi-channel outputs in order to benefit from the high-resolution audio soundtracks. My AV receiver has HDMI inputs and does something called “PCM” decoding, but it doesn't have its own Dolby TruHD or dts-HD Master Audio decoding. How do I get the improved soundtracks from a Blu-ray player? You'd need to set the Blu-ray player to stream multi-channel PCM (Pulse Code Modulation) over its HDMI connection to your AV receiver, which will then sort out the 5.1 or 7.1-channel soundtracks. As long as your AV receiver has PCM decoding from an HDMI connection, then you'll be able to derive full benefit from the upgraded high-resolution soundtracks that the Blu-ray player decodes and sends via PCM over HDMI. As long as your new HDTV video display has an HDMI input, then you can connect the Blu-ray player's HDMI output directly to the TV and enjoy the HD video quality that Blu-ray discs deliver. Even if your AV receiver lacks a multi-channel analog input set, you could still get a standard Dolby Digital “legacy” soundtrack from the Blu-ray player's optical or coaxial digital audio output. All Blu-ray players must be able to output a standard legacy Dolby Digital or dts 5.1-channel soundtrack that is contained within the data stream on Blu-ray discs. You already know that Dolby Digital and dts soundtracks sound good, so you can use those until such time as you want to update your AV receiver to one with HDMI inputs and Dolby TruHD or dts-HD Master Audio capability. I've heard that Blu-ray playback has extra features that you can sometimes access. What is that called? Among Blu-ray's many capabilities is something called “BD Live,” which some Blu-ray discs have and which will unlock extra features online when you are connected to the Internet and have a “Profile 2.0” Blu-ray player. Profile 2.0 compatibility enables on-screen video commentaries, picture-in-picture, and networking capabilities. Note too that BD Live-enhanced discs also tend to have slower loading times. If you don't need those extras, Blu-ray hd players with Profile 1.1 or 1.0 will still play back high-definition Blu-ray discs, but without the special picture-in-picture commentary and networking abilities. My standard DVD player has excellent up-converting capabilities to 1080p. Why should I give that up for a new Blu-ray hd player and its unknown deinterlacing and scaling abilities? Well, of course, you don't have to. You can leave your current DVD player connected and add a Blu-ray player if you have enough inputs and source switching to accommodate both machines. However, what most of the new Blu-ray players possess is highly sophisticated internal scaling and deinterlacing, so that standard DVDs will look first-rate played on the new Blu-ray player. In this regard, it's still worthwhile checking out test reports in magazines and on-line on new Blu-ray players' upconverting abilities, as there are performance differences from brand to brand. Isn't optical disc storage of movies on DVD or Blu-ray just a stopgap measure? 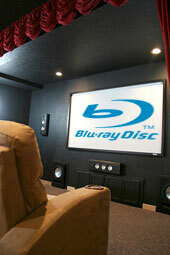 Why should I get a new Blu-ray player when streaming of HD movies over the Internet is already being offered? It's true that Netflix offers streaming of HD movies if you have a Blu-ray player with the ability to connect to the Internet and receive Netflix-streamed movies. However, so far, results and video quality are variable, partly because of the huge bandwidth required for HD video and high-rez audio soundtracks. In the future, of course, when every household is connected via fiber optic cable with its very fast and large data capacity, then streaming of HD content will become practical. There's still the convenience factor of disc storage—you can put it aside to watch anytime you choose, and there's an enormous range of entertainment already on DVD; admittedly fewer releases on Blu-ray, but the release list is growing each month. 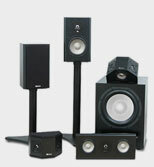 If you have further inquiries about blu ray hd players, visit Axiom's Forums for detailed help or e-mail us.